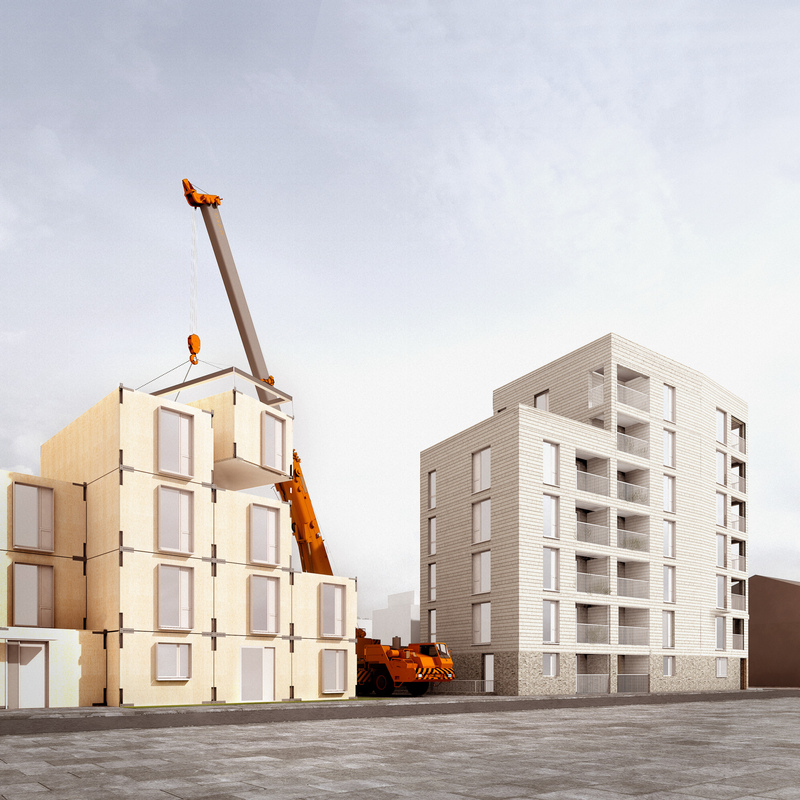 This landmark project will be the UK’s first mid-rise CLT modular scheme, precision engineered in Swan Housing’s factory. 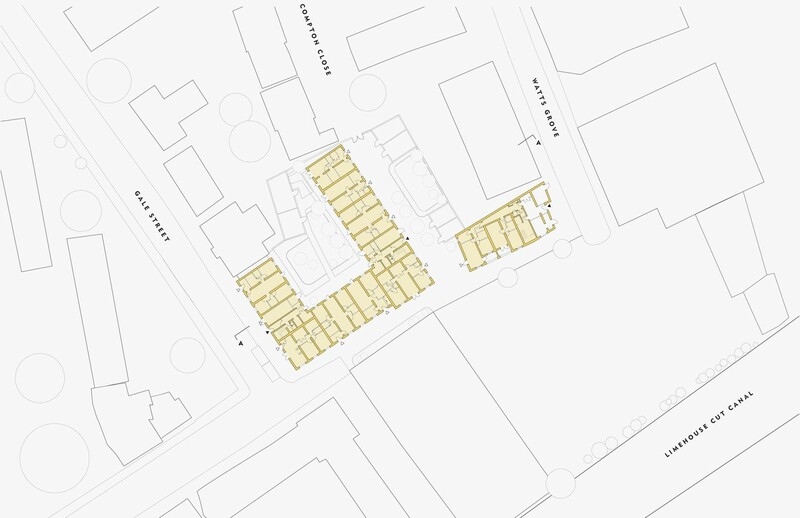 The 100% affordable development will bring 65 much needed homes to an undeveloped brownfield site in the Bow Common area of Tower Hamlets in east London. 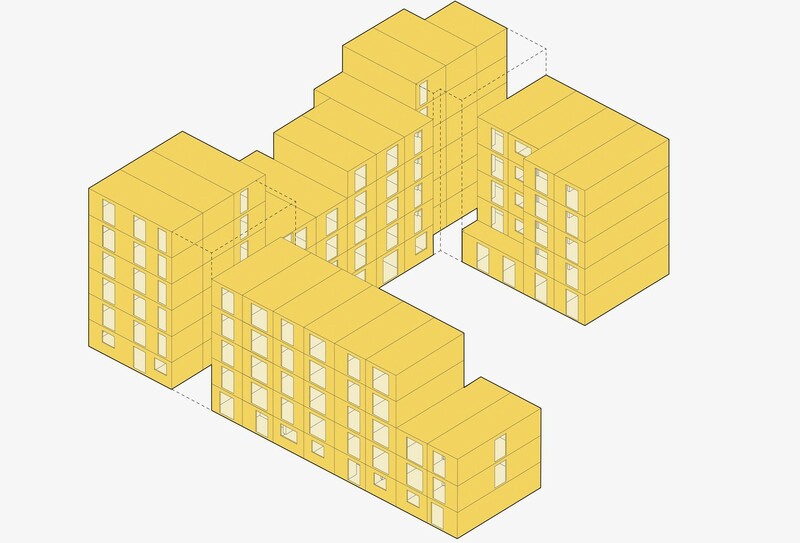 Responding to the mixed contextual setting residential blocks, warehouses and industrial buildings, the massing of the proposed building has been broken into a number of distinct elements, varying in height. 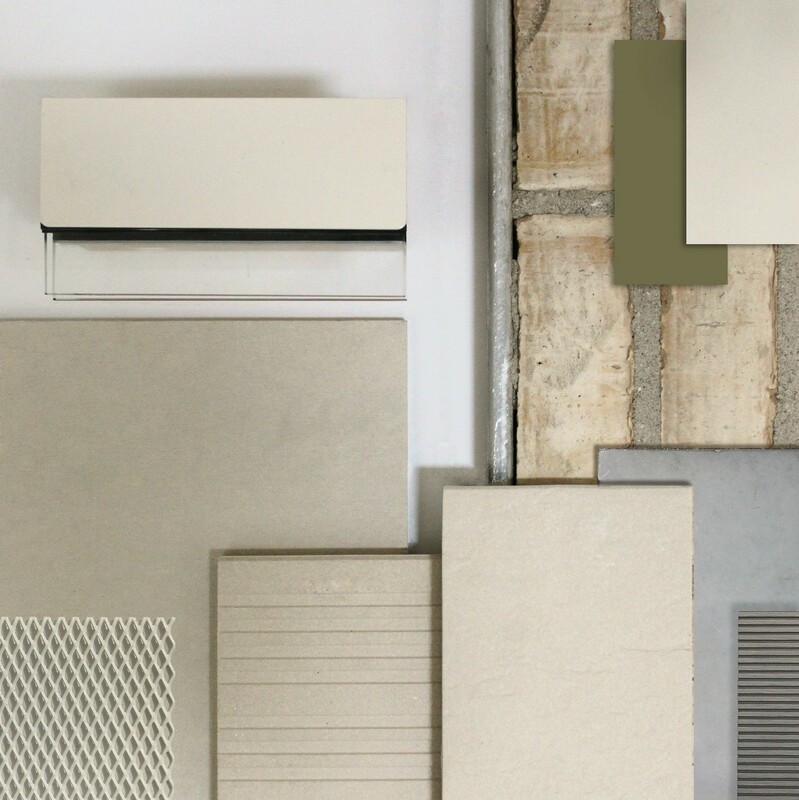 Materials with a muted colour palette of off-white and grey have been carefully selected to complement the surroundings. A datum across the buildings has been established by defining the ground floor, above which the elevational material changes from waterstruck, coal-fired bricks to lightweight clay shingles. Materials have been chosen that are robust and hardwearing, and will enhance with time ensuring that the building will age with sensitivity. All flats benefit from full height composite windows, letting in high levels of natural light, and generous, inset balconies. Private front doors to ground floor flats and front gardens ensure an active street presence, with defensible space provided by carefully considered planting. 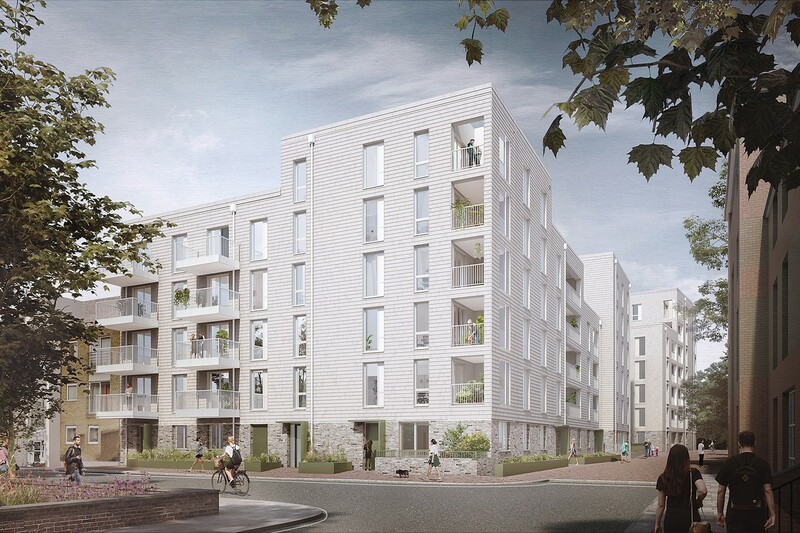 Watts Grove will be a car free development, set within landscaped courtyard gardens. 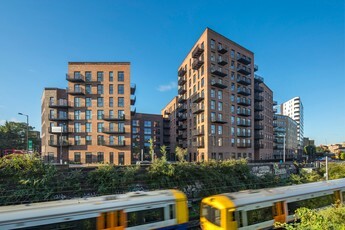 The buildings are defined by two new pedestrian routes across the site creating connections between neighbouring streets: a boulevard providing access to the Limehouse Cut canal, encouraging people to walk rather than drive and a pathway across the site from east to west improving pedestrian access to transport links. Further amenities are provided by including high quality play space that will benefit the wider community. 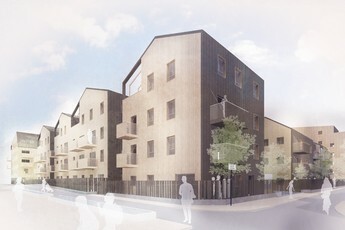 The homes will be made from sustainably forested CLT, assembled into modules at Swan’s factory in Basildon. They will then be fitted out with kitchens, bathrooms, finishes and fittings under factory conditions, offering a level of quality and consistency that is not normally achieved through traditional construction methods. Expected to be constructed in 50% less time than a traditional build and at 10% less cost, Watts Grove unlocks a difficult site, and demonstrates what can be achieved with offsite construction. Drawing on the efficient production methods and the product quality developed by the manufacturing industry, this way of building uses less energy than traditional construction. 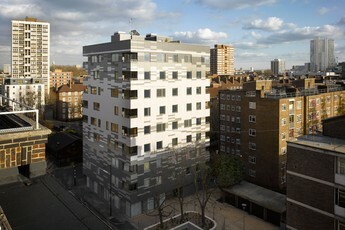 Offsite production minimises the impact of the build on the neighbourhood, reducing deliveries, noise and disruption. 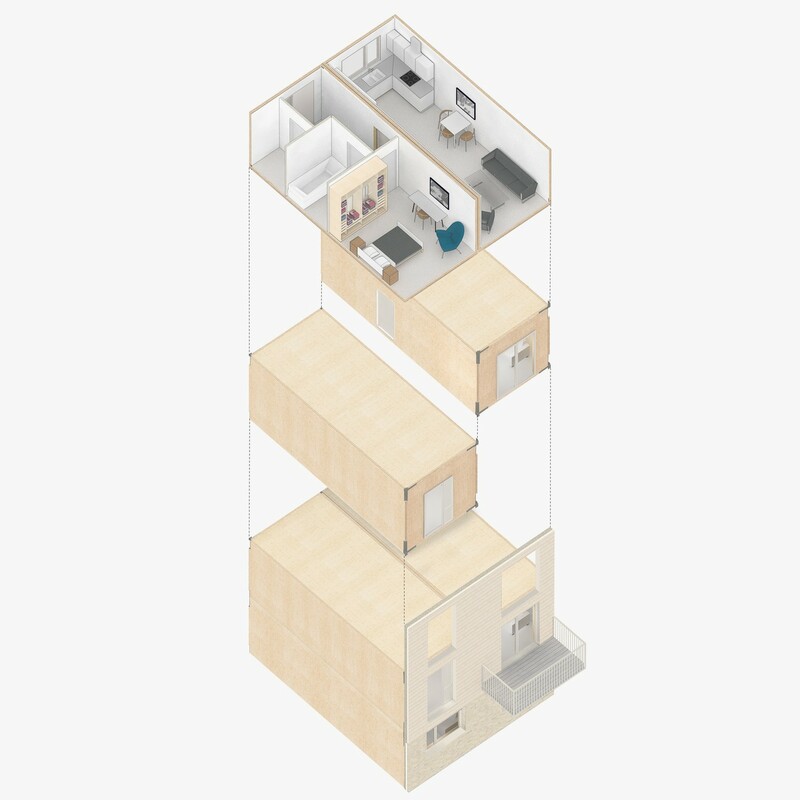 These high quality modular homes are energy efficient and sustainable, and yet can be indistinguishable from traditionally built homes. 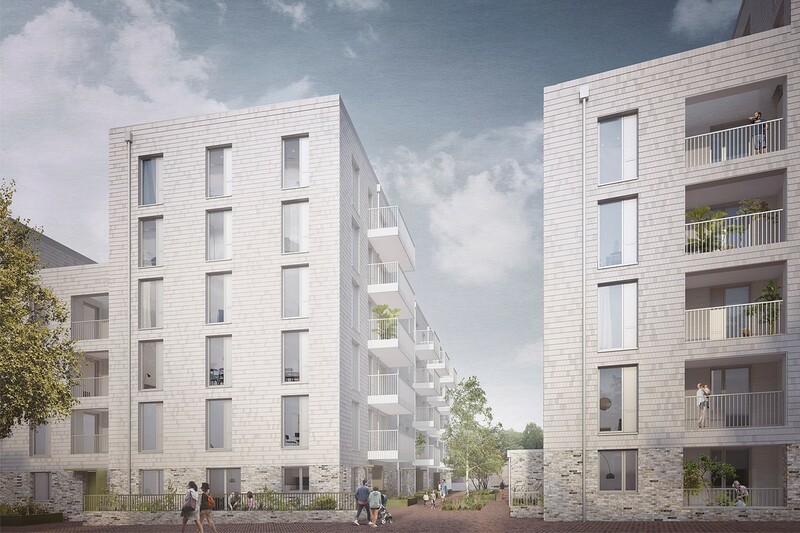 However, unlike a traditionally built block there will be 2,350m3 of CLT making up the structure of Watts Grove, and this will lock away 1,857 tonnes of CO2, the building itself becoming a long term carbon store.